As you may be aware, I'm a Windows guy. I'm not diehard about it, however. When the time comes for me to get a new laptop in the next year or so, I'll be open to switching, making me Apple's target market. But there's one big reason that is holding me back from making that switch: price. Apple's laptops are expensive as hell, and the prices aren't justified. 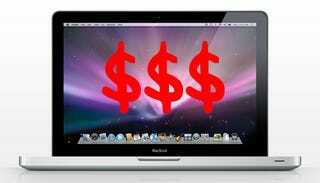 Update: We have edited this post to reflect the real hardware/price comparison between the Dell and the Apple laptops. The bottom line: They are not comparable. Our apologies for the mistakes in the original article. -J.D. Let's just look at the 13-inch MacBook that was just announced, for example. For $1,300, it comes with a 2.0GHz Core 2 Duo, 2GB of RAM and a 160GB hard drive. Over at Dell, I can grab an Inspiron 13 laptop with a 13.3-inch screen, a 2.0GHz Core 2 Duo, 3GB of RAM and a 250GB hard drive. For $750. For those of you keeping score at home, that's a $550 difference, and the specs are better on the cheaper Dell. Actually, the specs on the Dell are not better, as reader Giz James Topoleski pointed out. In fact, the MacBook seems like a much better machine than the Dell except for the 1GB of extra RAM and larger hard drive. • The Dell uses Intel graphics instead of the much better NVIDIA GeForce 9400M, which is currently unavailable in any other computer. • The Dell uses a 802.11g Mini-Card as oposed to the MacBook's Wireless N card. • While it has 3GB of Shared Dual Channel DDR2 RAM at 667MHz, the 2GB of RAM in the MacBook is 1066MHz DDR3 SDRAM. • The Dell has an Intel Core 2 Duo T5750 with 667MHz bus and 2MB cache as opposed to the Intel Core 2 Duo with 3MB on chip and 1066 MHz bus on the MacBook. • The Dell has no Bluetooth by default. • There's no HD video output on the Dell and no option for one. • There's no gigabit Eithernet. So as you can see, the price difference is quite reasonable, and that's without counting on things like the multi-touch no-button glass trackpad or the iLife multimedia suite, both things not included in the Dell. It's like comparing last year's car model with this year's. Apple has always put a price premium on its products, and people pay it, which is great for them. But for people who aren't already on the Apple bandwagon and for people who aren't having their computers bought for them by rich parents, like the college kids who snap up these laptops every August, there's no incentive to switch. Maybe Leopard is way better than Vista. I don't know, I haven't extensively used either. But when the time comes to buy a new computer that comes loaded with one or the other, one thing is going to make my decision for me, and it isn't shiny glass things or funny commercials. It's the price. And I don't think I'm alone on that one. Note: While this last point may be arguable, it's certainly not the case of the MacBook. Even while the MacBook has less storage space and memory than the Dell, it seems competitively priced looking at the technologies including in the package. -J.D.